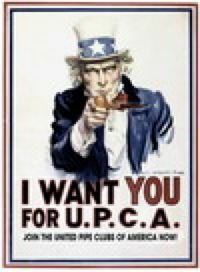 The Upstate Pipe Society will be holding their 2015 Southeast Regional Pipe Smoking Contest on September 26th, 2015 at Boda Pipes, Greenville, SC. After much deliberation, they have chosen the Comoy Pebble Grain (#495) as the official pipe for the contest. The pipes are available for viewing, and the tobacco may be sampled and/or purchased at our store during regular store hours. Only 25 entries available at this point, so register today! On behalf of the members of The Upstate Pipe Society, I would like to extend my sincere gratitude for your contribution to the 2015 Fall Slow Smoke competition held on Saturday, September 26 at Boda Pipes & Cigars in Greenville, SC. The event was successful, with a winning time of 54 minutes. We were able to give away some great prizes, including the pipe, hats, patches, pins, and tobacco from you guys. But, I believe the trophy was the biggest hit!